The Packworld of Greiner Packaging International is a world of adventure and a centre for customers, innovation and communication at the same time. As a place for meeting and communication, it offers the ideal spatial framework for events around packaging and innovation. The Deutsches Verpackungsinstitut dvi chose Packworld as the location for an event which is marked by innovation. 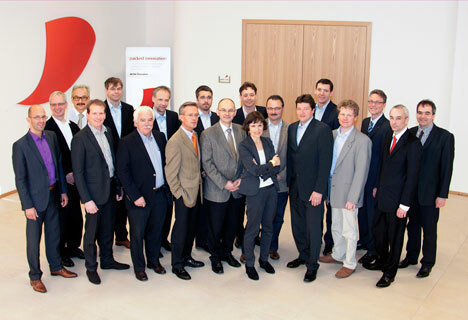 The innovation circles of the packaging producers and brand-name product producers met on 12 April 2011 in Oberwaltersdorf to exchange opinions on the topic of innovation on reasonably authentic ground. The innovation expert Dr. Gertraud Leimüller led the morning programme. A Harvard graduate and former economics journalist for the Austrian newspaper Salzburger Nachrichten, she used the motto “Open Innovation” for her lecture. At present, Leimüller is the chief executive and founder of winnovation consulting gmbh, a specialist consulting agency for innovation policy and innovation management. After lunch Robert Obermayr, K1/K2 product group director at Greiner Packaging International, gave the participants of the meeting a guided tour of Packworld. The rest of the afternoon was left for discussions under the auspices of exchanging experiences. The organiser of the meeting day at Packworld, Deutsches Verpackungsinstitut dvi, as a network within the packaging industry supports the transfer of know-how. It promotes the dialogue between companies, institutions and partners. At the same time, it is a platform for information, insights, impulses and exchange on the topic of packaging. The members of the Deutsches Verpackungsinstitut dvi come from all stages of the value chain.